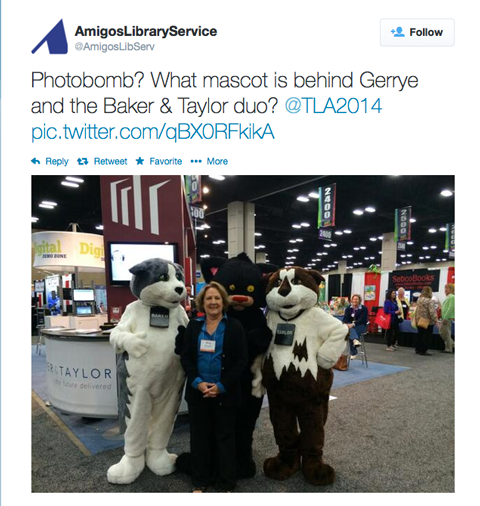 Are people sharing photos and talking about your business? Do you need to breathe new life into your word-of-mouth tactics? You don’t have to create elaborate campaigns to drive visibility for your business. In this article you’ll discover four ways to make customers want to take and share pictures related to your brand. No one leaves the house without their smartphone. Documenting our every action is woven into our daily routines and photos are the easiest way to do that. And yet I’m constantly surprised that most businesses don’t take advantage of this marketing opportunity. It only takes a simple request and most people are happy to take and share pictures while in your store or at your event—especially if you give them a fun way to do it. You can increase your return on these social shares by highlighting your social profile URLs, handle and hashtag in high-traffic areas and asking people to tag you in their updates. Below are four ways to make it irresistible to share photos of your brand. 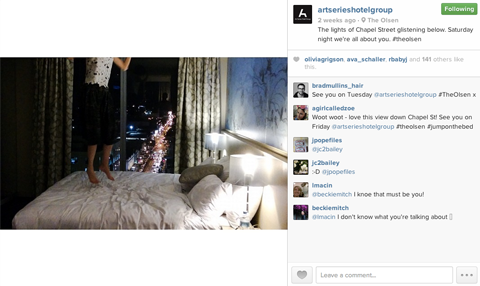 I love the way Art Series Hotels have infused fun into their guests’ stay–and increased social shares about their brand to boot. The hotels leave postcards in guests’ rooms asking them to jump on the bed and share the fun photos with their friends (tagging the hotel of course). Come up with a fun way for customers to share your company with their friends. This tactic has seen quite a bit of success because the kidults love to share pictures of themselves being silly in unexpected ways. When’s the last time you jumped on a bed? To further encourage photo sharing, offer immediate special discounts for photo shares. To keep submissions flowing, you can even offer a separate weekly prize for the best photo shared. Qantas Airways knows people love to be a little silly. Fun backdrops and props are a great way to make yourself stand out when people visit or walk by. If you have space at your business or are exhibiting at a conference, use art installations, themed cardboard cutouts or decorated spaces with props (e.g., hats, mustaches, capes and other accessories) and encourage people to take pictures. Depending on your product, it may be a fit to include it in your photo ops as well. However, be aware of over-branding the experience. Too much obvious selling turns people off and ruins the fun vibe. It’s OK to subtly include your brand name, hashtag and handle in your backdrops (and remind customers to use them in their updates). 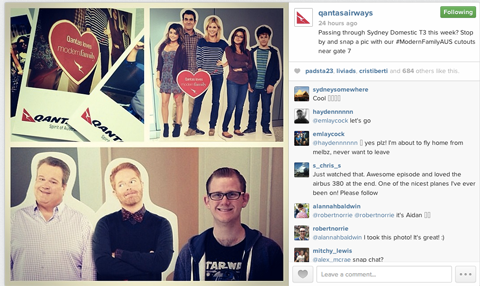 Qantas Airways scatters cardboard cutouts of Modern Family in their airports, encouraging passengers to take photos with the stars. You don’t need to spend a lot of money on photo props (maybe none at all)—simple ideas often work best. The main thing is to focus on making the space fun so peoplewant to take photos and share them. If you’re hosting a live event, give attendees the chance to come and take photos with the stars of the show. These meet-and-greets sometimes create more social chatter than the event itself! Photo fads (and memes) come and go. We’ve seen planking, owling, photobombing, and of course, selfies. Why not take advantage of the latest hot meme for your business? With a little creativity, just about anything can be incorporated into your brand’s next campaign. For example, Currumbin Wildlife Sanctuary asked customers to take selfies with some of the sanctuary animals. The results were pretty amazing. One visitor took a photo with a resident kangaroo that was liked over 41,000 times! 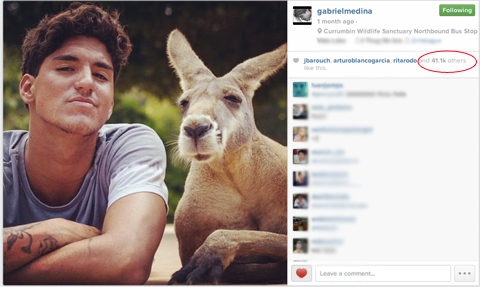 South American surfer Gabriel Medina’s kangaroo image was liked over 41,000 times. Or if you have a mascot, invite people to take a picture of themselves in front of your backdrop then secretly have your mascot photobomb the picture. Take advantage of funny photo memes to get more shares. Taking advantage of the latest trends is sure to bring a smile and people will want to share the fun moment with their friends. 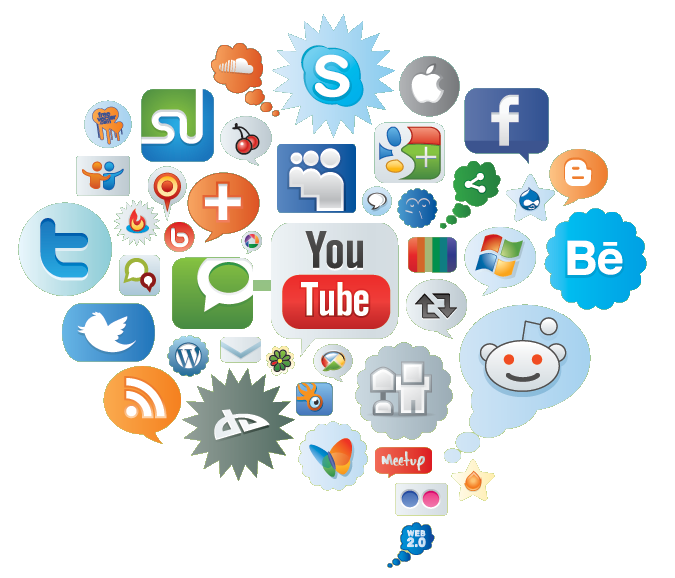 Customer-generated content makes a big difference in your social presence. When others share your business with their friends and followers, your reach can expand exponentially. To be sure you don’t miss the buzz, set up alerts for your company name, product or hashtag so you know who’s mentioning you and where. Acknowledge people who share great content about you by resharing their content on your own social channels, thanking them and tagging them (and use your hashtag). I’ve seen clients get 10 times more engagement by sharing a customer’s Instagram photo on the company Facebook page than they do with some of their own photographers’ best shots. 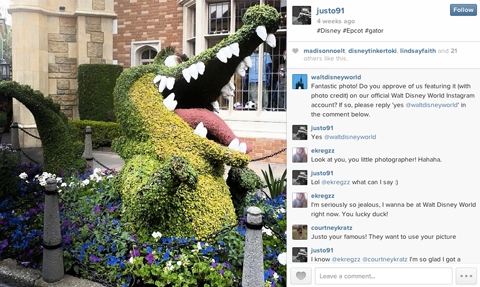 Walt Disney World Resort asks a guest for permission to republish his Epcot photo. In many cases, you may even want to cross-post user-generated content to your own blog or website. Before you do, ask for permission and include a link to the fan’s handle or account where they originally shared the photo. That kind of respect and acknowledgement is an important way of creating a stronger connection with fans. I have just one word of caution: Be sure to check the user’s prior posts and the comments on the photo. You don’t want to drive traffic to a post with derogatory or unsavory comments. People love to take pictures, especially of themselves doing unexpected activities. And since images are the best way to catch people’s attention, it makes sense to incorporate them into your marketing tactics, both online and in-store. When you ask people to share pictures, give them a fun way to do it andencourage them to tag you, and they’re very likely to do it. It’s amazing how simple ideas can have a big impact on the social reach of your brand or brand experience.